Meet Bill… he’s an avid yogini and can do Downward Dog like a pro. But every once in awhile he comes in with odd pains in his shoulders and arms… in the Winter, usually just after a big snow storm. You see… Bill, is a nice guy. A super nice guy. And Bill, well… he loves to snow blow with his amazing snowblower. He likes to snow blow his driveway, his walkway, a path to the mailbox… and then the neighbor’s driveway, and their walkway… and then another neighbor, and so on. I call it, SOS or Snowblower Overload Syndrome! Bill completely overdid his body by doing his good Winter’s deed. When he came to see me this year, he was is so much pain, he couldn’t even button his shirt that morning! His symptoms are shooting pains in his arms and numbness in his fingers. 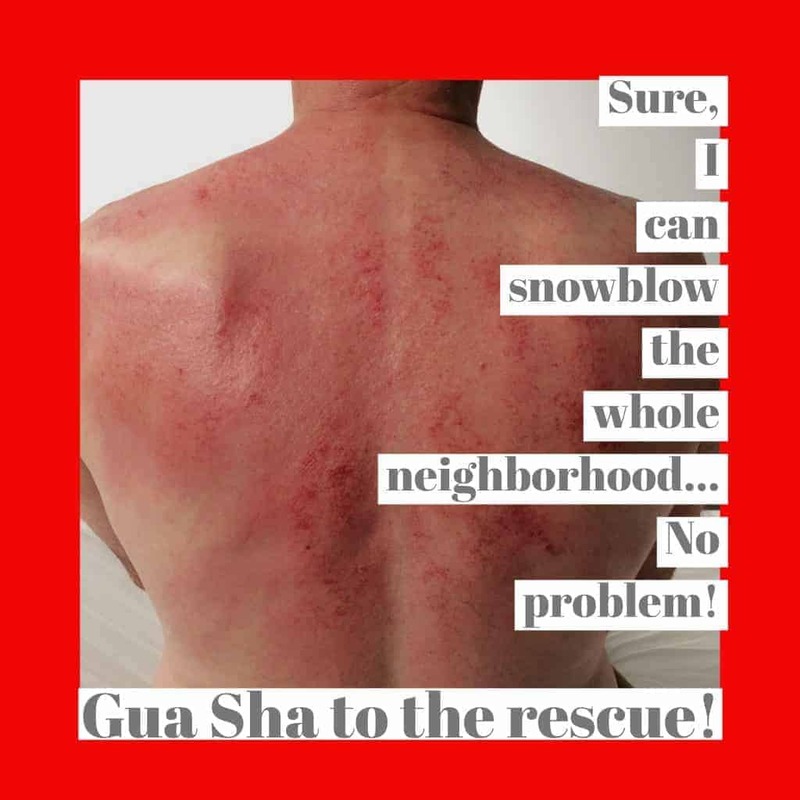 (Usually, all of this typically goes away with one or two good Gua Sha sessions!) The first step is to figure out where to focus my treatment. I need to plan my attack on this case of SOS–my first of the 2018 Winter season! I first ask him which fingers are tingling… this time he says his forefinger, middle finger, and ring finger. That makes sense. These are the channels that run through the top of the shoulder (acromioclavicular joint) area, across the supraspinatus and top of the trapezius, over into the bottom of the neck (C 7) area, and then up the scalenes into the head. That means while he is sitting up with his back to me, I start with doing Gua Sha from the top down, first doing the back and sides of the neck, then across the tops of the shoulders and back of the shoulder blades, and finally into the deltoids area. If you are not familiar with Gua Sha, it is an ancient healing technique that involves light scraping of the skin with a smooth tool to lift stuck energy out of the muscles and fascia and thus relieve pain. 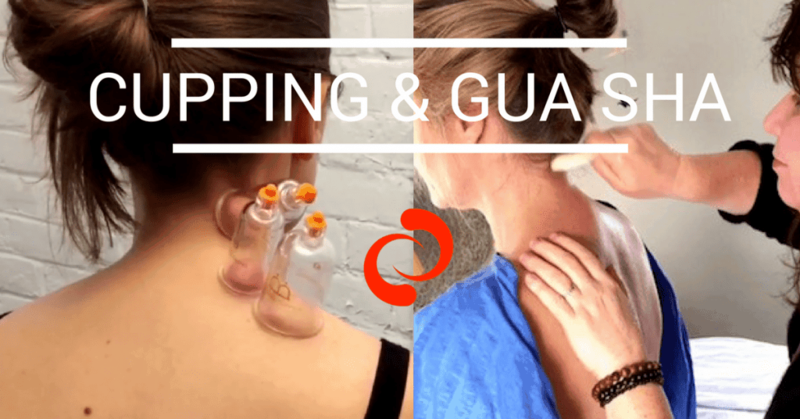 TIP: While doing Gua Sha in the acromion area, you’ll need to lift the arm up away from the body (abduction), to access the muscles better. 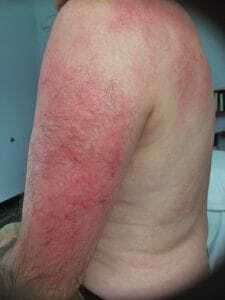 Then I have him lie down, and complete the Gua Sha down the deltoids and into the dorsal side of the forearm (palm down). Because the middle finger is involved, which is the Pericardium meridian, I also do Gua Sha on the pectoral muscles and follow that line down over the biceps into the center of the ventral side of the forearm (palm up). 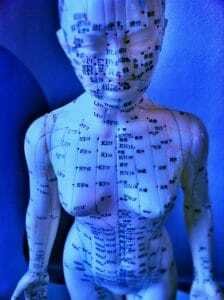 TIP: It’s a good idea to keep a meridian doll in your office if you’re doing Gua Sha to be able to identify the meridians. And clients love to see what and where things are going on in their body. When I finished Bill’s treatment, he got up off the table, moved his arm, and said it felt completely normal! Gua Sha to the rescue once again.